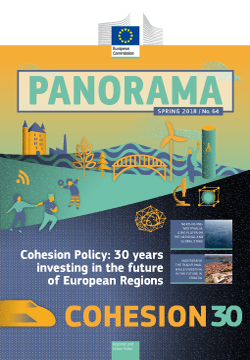 The Spring issue of Panorama magazine, now available to download, marks the 30th anniversary of the creation of Cohesion Policy with two special features. A look back at the five programming periods shows, via maps and infographics, how the policy and the regions it serves have evolved over time. We also highlight 30 emblematic projects from across all Member States, showing the breadth and effectiveness of the investments made. Our regional profile this time looks at North Rhine-Westphalia in Germany, with project profiles and an interview with Prof. Andreas Pinkwart, Minister for Economic Affairs, Innovation, Digitalisation and Energy of North Rhine-Westphalia. We also explore ERDF’s support for SMEs, Territorial Impact Assessments, and the Commission’s new toolkit for integrating people with a migrant background. Elsewhere, we explain the collaboration between the EU and Norway, Iceland and Liechtenstein through the European Economic Area Agreement. There is also an interview with Jacques Mézard, French Minister for Territorial Cohesion, who surveys the past, present and future of Cohesion Policy’s impact in France. ‘In Your Own Words’ includes contributions from Tuscany, Brandenburg and the Atlantic Arc Cities association, and the projects section visits Estonia, Austria and Greece.